Game Idea: An Asteroids based game with ESCALATING POWER LEVELS! A Windows Game that focuses on a WIN BIG / FAIL HARD feedback loop. 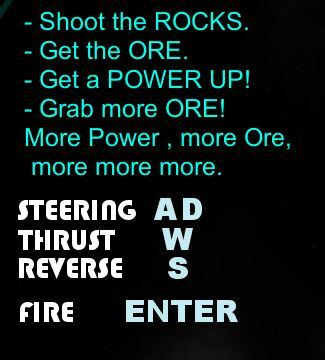 Collect Ore to trigger a power-up. Grab more Ore to keep the thunder rolling. FYI there are 3 different power ups that will activate randomly each time you fill up the guage. The longer you keep filling up the guage, the crazier your power becomes. Bullet Storms, Fire Orbs and Reflection shields will grow insane. But don't get cocky. Your space suit is not a suit of armor. That's what your guns are for! If you don't have the means to play... Enjoy this short informative video. Finally managed to post the full submission above! I'm very happy with the way this Jam turned out! Scope was reasonable, and I had extra time to add an extra mechanic. It's not flawless but I'm happy and proud. Please feel free to give criticism. This is really awesome, Pierre. love when things get redonculous and when you can keep that power meter up. Really solid! The momentum bar is a simple but effective way to provide the aggressive playstyle that makes this experience rewarding, plus I do appreciate its nod to the theme. I seemed to encounter issues sometimes where taps weren't registering to fire, but that may just be my trackpad attempts. I would have liked more departures from the classic Asteroid framework, but this is a pretty respectable package in itself. Jamming done well! Thanks for taking the time! And thanks for the feedback! Indeed, The forced firing rate was an unnecessary mechanic that I wanted to address, but I ran out of time. I will certainly address this in revision after the competition, so that you can fire on demand. Thanks! I will be improving and adding more so check back at the end of this week for the revised out-of-comp version. I will post a separate link. Let me know if there is anything you might like to change. @Pierre This is excellent! I love the feel of the game. What did you use to create those models? I was also happy to see left mouse worked for firing. The description in the OP said ENTER - Fire. The power-ups work great and my fav is the bullet storm. When that thing goes off it is mayhem everywhere. Lots of juice and effects and you can feel the game escalating while realising demise is imminent. I really like the character. With the jetpack firing it does look like the wings of a bumble bee. @konman thanks for the great feedbaxk. Wow. Yes. I believe in making many many buttons available as input in my games. I don't mention all of them in the instructions though. The reason for this is that i want to keep the information simple and bite sized. If a player intuitively tries to use something else, and it works, then that is great. The game has no win condition or a score count or anything. But i will add something in a post jam iteration. Something that progresses the game. If there is anything you might have preferred to be different, or to have added, pls let me know. There is a lot more you can add, e.g a larger play area, multiple levels, more power ups, maybe some AI enemies, more more more :) etc or some other mechanics that progresses the game further... Crafting? a story even? It depends on your personal goal for this and what you're getting out of making it. I am glad to hear you plan a post jam iteration. I'll give any new builds a play and provide honest feedback where I can and I am sure others here will too. What did you use to create those models? The Asteroids were Icospheres with some randomization and smoothing applied in varying degrees. The Bomble-B is a Low Poly model that was made with additive vertex modeling. The texture was painted by dropping selected face UV's into blocks of color on a palette texture. The animations was done with a simplified rig of disconnected bones. The rig has a mixture of looping animations for states of Flying, Idle and Shooting, and I blend between these with a 0 - 1 shooting and 0 - 1 flying parameter value that is passed to the animator. Overall the creation of these models and animations took about 2:30 hours. Feels like quite a neat complete little package, nice one. I didn't quite understand the choice to limit the player character movement inside the radius, I might be missing something there, it's better to give incentive for the player to want to be somewhere than to arbitrarily limit their movement space, specially in a game set in space, where the movement naturally wants to be free. The animations of the dude are cute, I know working 3d in any jam is actually quite a challenge so kudos for going that route. The little mans tangents could use some adjustments. The weights on the start and end frames are causing the loop to feel sticky, cyclic animations should be fluid, with no bumps in the transition from first to last frames. You can use the Make Cyclic function (Shift E) to see how the curves blend between the first and last keyframes. It's great that you managed to make something that feels quite complete. @Pomb thanks for the animation tip. To be honest. that was something I've neglected for a long time because I wasn't aware of the solution. I will definitely look into it! The play field limitation is a tricky problem. I will try it out in a future iteration and see how it feels. I've fixed/improved a bunch of things mentioned by friends and fellow members. 2. Tap firing works the same as holding down the trigger. @Nandrew, it is no longer missing the taps. 3. Asteroids move around a bit more with behind the scenes code added for far-out asteroids to speed up and aim for the player. 4. Better Death animation with improved visuals and sound! I found the controls tricky. I think it was disorienting that when I turned left and right the camera would do a little tilt too; I don't expect this from a camera that's effectively at a top-down view, and it made my movements feel less precise. I suppose this is something I could learn, but my expectation when shooting a rock that breaks up is that the force of my projectile would direct the rock (and its broken pieces) away from me. Having broken rock pieces sometimes shoot straight at me felt unfair when it happened. The random shooting power-up felt particularly cool! The amount of content you got in was very impressive, especially considering you jammed solo. Congrats! I found the controls tricky. Yeah. I had several long conversations with Steven about the controls and the camera in this game. Your points are very valid and I will try and explain why I decided to keep things the way they are. I decided to stick with this abstract method of steering. Though it might seem outdated to some, I believe that it adds a complexity in controls that players need to master. But others might see it as an unnecessary complication. This camera system has a 50/50 hit/miss ratio. Some people feel comfortable with it, others don't. I personally love it, and the only way I can describe why, is that it feel more "flyie". Ever since implementing it, going back to the conventional camera tracking methods feels rigid and stiff to me. The problem might be that different players focus on different points in the screen? Or perhaps they track the environment differently? I also notice that the effect is less noticeable as the physical size of the screen increases. I'm really curious to find out more about why some people find it so jarring and others find it comfortable. I decided to leave it in and see what the general population think about it. my expectation when shooting a rock that breaks up is that the force of my projectile would direct the rock (and its broken pieces) away from me. I agree. I should have added a bit of bias to the new direction of smaller rocks. At the very least they should not come straight at you. I will keep this in mind if I do any further iteration. That said, those little surprises added a lot of excitement when I managed to evade them or shoot them down at the last moment. Perhaps there is something to be said for returning "fire", and it might have a place in the game if I can give the player enough warning or distance to react. TL;DR below is a summary of how I jammed and scoped. Base Code helps a lot. Freelives gave the thumbs up for using base code, so I made sure my base code was clean and bug free prior to the jam. I actually called it my BaseJam Pack. This allowed me to focus most of my jamtime on the unique assets , mechanics and balancing in F.O.B.B. I also spent several hours planning the jam and the game before even touching my laptop; A lot of paper notes. I kept the scope small and I iterated in small valuable increments. Every new special mechanic I managed to add would be a bonus. I wanted at least three. There was going to be five mechanics in total, but playtesting revealed that two of them were duds. In the end it all stacked up beautifully with a little bit of time to spare. I didn't have to crunch and I had a relatively decent amount of sleep. I knew that having a refreshed brain every morning meant I could get more done in less time. I also refrained from drinking energy drinks or alcoholic beverages. I mostly drank fruit juice and water, and I had a few cups of coffee. I had some instant oats for breakfast in the mornings, and ate fruit during the day. Saturday night I ate a sturdy meal to balance out the fruit. Also, I packed toiletries so I could wash my face and brush my teeth. And after a change of clothes I felt refreshed and energized.